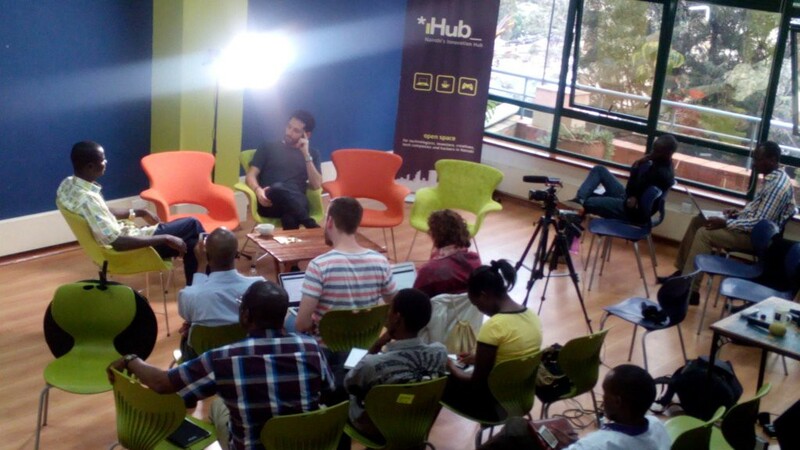 Kicking off an open interview with Kahit Hien, a Burkinabe food entrepreneur visiting Kenya to trade experiences with a pan-African group of engineering entrepreneurs. The empty chairs are for anyone in the audience to join in as an interviewer. When it comes to getting education right in topics and places where the standard stuff just doesn’t work, Peer Learning has been the answer for us. So far, it’s been described as something that happens in classrooms, but this excludes things like writers’ groups, farmer field schools, and tech meetups, which are all great Peer Learning environments. 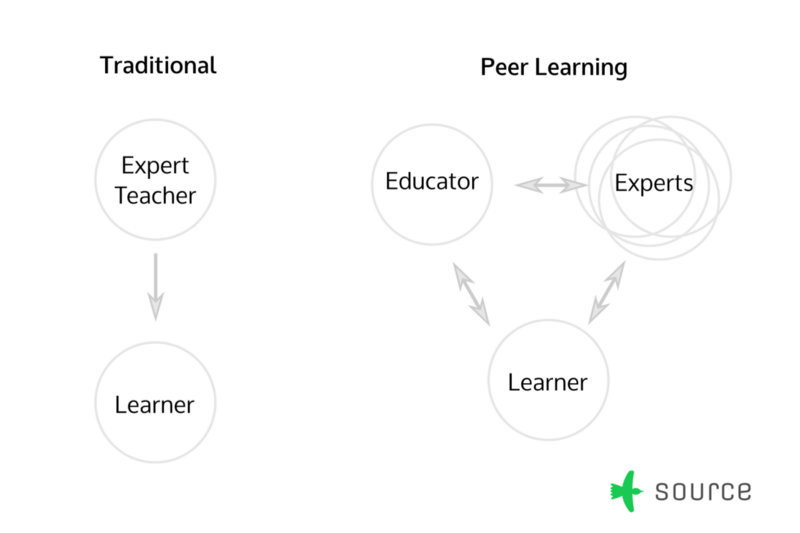 Peer Learning is self-directed, collaborative education in which the participating peers assemble the collective wisdom that is necessary to accomplish learning outcomes. Conventional education is delivered by an authority in front of a class. That authority is expected to be an expert, and they determine the direction of the education, the measure for achieving success, as well as the knowledge sources that are to be used to generate learning outcomes. If what you want to learn is timeless, centralizing that knowledge and repeating it in such predictable environments makes sense. When what you want to learn is an emerging topic, or scattered in various, disconnected places, when there is more uncertainty in the “final truths” or the environment is changing quickly, then it’s necessary to build conduits to distributed knowledge. Peer learning works well here, because each peer holds a bit of the workable knowledge, and the learner can piece it together in her interaction with her community of peers. Because today’s world is changing at an accelerating rate, more and more subjects are emergent, so we see a growing need for peer learning. Plus, peer learning puts the reins of education into the hands of the learner, which is important when the goal is to empower doers and changers. With peer learning, the learner sets their goals, and in many cases, the topics too. Peer Learning is usually a better choice when the “right answer” isn’t known, is changing, or is contextual. Peer Learning usually evolves into place. It starts ad-hoc and informally, like when someone finds someone else with similar interests, or from within traditional education programs to address needs that aren’t quite being met. It takes time and repeated effort to evolve the mode of education from a more structured, programmatic approach, into a peer learning culture. Peer learning programs evolve in co-dependence with the progress of the learner. As programs shift away from pre-planned and pre-scripted content, they turn towards assessing the learners needs as they emerge. In turn, this allows learners to become more self-directed, and allows the program to turn effort towards more relevant connections to knowledge sources. Learners, especially those who are learning as they go, are all different. Rather than try to predict their needs and lock them to the same path, peer learning environments instead provide support and knowledge as and when it is needed. A program’s ability to systematically assess and provide knowledge as and when it is needed. At first, that means getting the learners’ goals and questions up-front, and at a more advanced level, it requires diagnosing each learner before they begin. You might plan a talk on the importance of design thinking, but half the participants are industrial engineers so you’re preaching to the choir. You might have a great class lined up on starting creative writing projects, but most participants have publishers waiting on them for releasing their second, or even third book. They know the basics. You might see that a business workshop is badly needed, but your technical people don’t see the point of “the business side.” They don’t engage. Some don’t even show up. The key to being relevant is to calibrate early and often. By Calibration, we mean systematically assessing each learner’s needs, goals and perspectives. 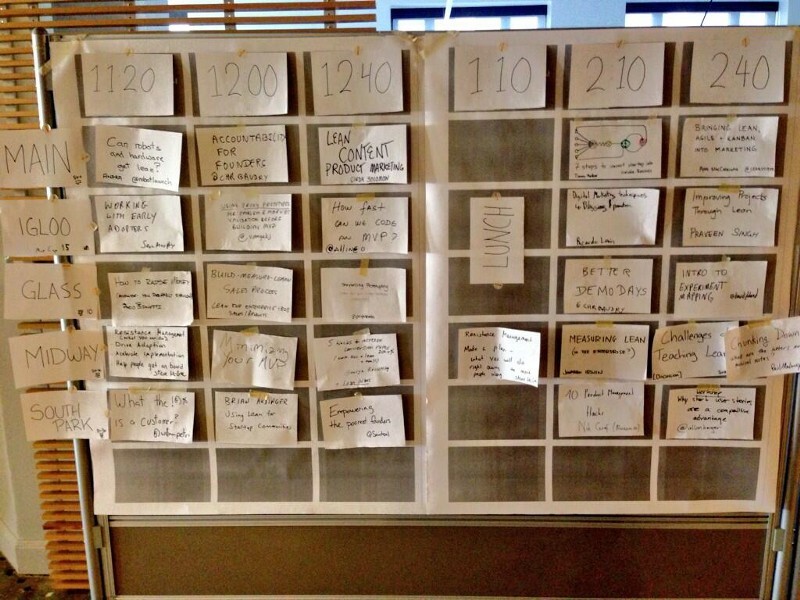 At Leancamp, the whole conference schedule is set by the participants, not the speakers. In some cases, it’s sufficient to ask the learners what topics or aspects of a topic they’d like to learn. In others, they may be unaware of what they don’t know, or the broader context of their journey, so Calibration requires getting deeper understanding of their needs through conversations with an expert, mentor or coach. Systematic Calibration is one half of responsiveness. The other half is systematically adapting and responding to the needs that have been identified. Levels of Responsiveness to the learners’ needs. Responding to learners’ needs usually involves more than offering lectures or courses on the topics they request. At first, it is sufficient to anticipate different learning needs, and prepare a range of content options, depending on their context, culture or experience. For example, a creative writing workshop could have prepared modules that go deep on plot, dialog or character development, selected based on the writing projects the students bring. As learning goals become more advanced, they become more specific, and this means prepared content becomes insufficient or impractical. Maybe the more advanced writers need to dig in with specific writing styles, or research techniques, or a hundred other things you can’t prepare. More sophisticated forms of responsiveness are able to react appropriately without prepared content, relying on a wider range of educational formats and domain experts to attain learning outcomes. At scale, learners and domain experts are able to find each other efficiently, without the need for a centralised assessment and referral. A program can offer responsiveness to a learner’s need in varying degrees. Level 0: Ignorant. The form and content of education are predetermined and unchanging in the face of different learning needs. Level 1: Calibrated. Learners are invited to ask questions, and state learning goals at the start of, and during the learning experience. These questions are responded to with pre-determined modules that allow for some variance in delivery from the major predetermined content. Level 2: Diagnostic. Learners needs are proactively and deeply assessed through activities such as mentoring, before the learning experience takes place. 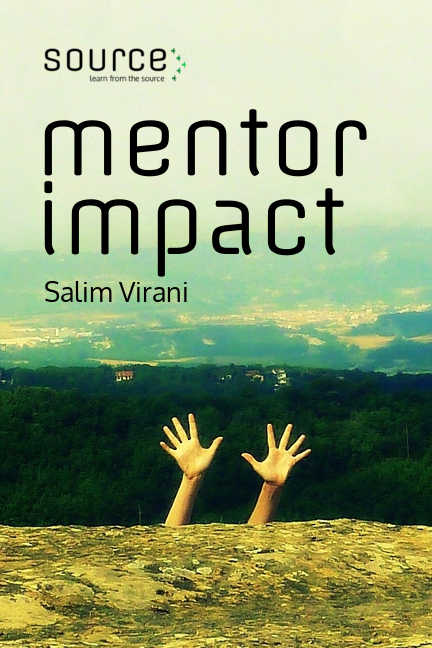 Peer Learning environments are able to assess learning needs through mentoring interactions between its peer constituents, and respond to them by involving relevant expertise. Flexibility given to the learners in deciding their learning outcomes. This starts with inspiring and empowering the learner to self-direct, and then builds on that self-direction by switching to a supporting rather than directing role. Success in education is determined by what the learner becomes, not what they study or what they can repeat. And in almost every case, the role of the educator includes developing the learner’s mindset, and inspiring them. Agency represents the learner’s ability to act towards achieving their learning outcomes. In a peer learning context, agency refers to the ability of the learner to self-direct. Agency in a program context means an education program that is conducive to supporting autonomous peers who have different goals and take different actions. Peer learning firstly builds the learner towards a state of agency. It enables them to spot their own opportunities and act on them. This happens through experiential learning exercises that inspire, build skills, as well as confidence, and thereby encourage the mindset with the learner to take command. An observable success condition of experiential learning is when the learner becomes more self-directed, and their project goals direct their learning goals. They are able to articulate learning goals, and defend them. Workshop participants sharing their main challenges, and what they want to learn to do differently. Once learners have been made aware of their agency, and they are actively setting goals and communicating them, the next phase builds on this agency. Since learners now define, and specify what they need for their own learning journey, the education dynamic shifts from a learning push by the educator, towards one where the learner pulls with specific requests. This inherently implies a shift in the role of the educator towards one of facilitation and support. As more learners start building on their agency, a culture of practice emerges. Level 0: Constraining. The learner’s path is dictated completely by the program design. Level 1: Enabling Agency. The learner is taken through various advancement levels of learning exercises where they can specify how they would like to achieve learning outcomes. Level 2: Active Agency. 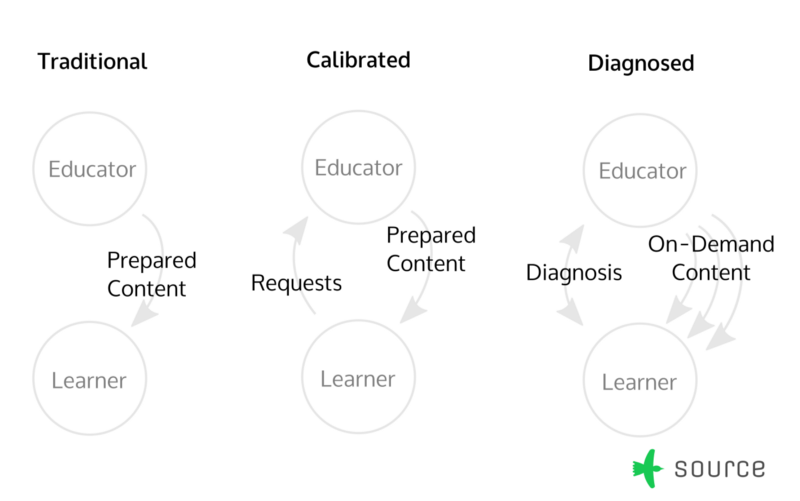 Pull-based education — the education programs delivers the entirety of the learning experience on demand. The learner sets their goals, and learning institution responds in a facilitation and supporting role. Disciplines are specialising and intertwining at a faster pace, as are learners’ goals and challenges. Even where deep research and siloed knowledge are concerned, the nature of learning goals increasingly crosses formal boundaries. Being able to make meaningful connections that jump outside of the learner’s network, to the most relevant sources. This starts with brokering select connections on the learner’s behalf, and evolves into creating environments where they can make those connections instantly by themselves. For learners to succeed on their own terms, they need to pick, choose, and connect subjects. The more innovative the learners’ ambitions, the more likely they need to learn from innovators and experimenters who aren’t authorities. This is even the case when innovating in subjects where academic institutions have already developed deep bodies of knowledge. 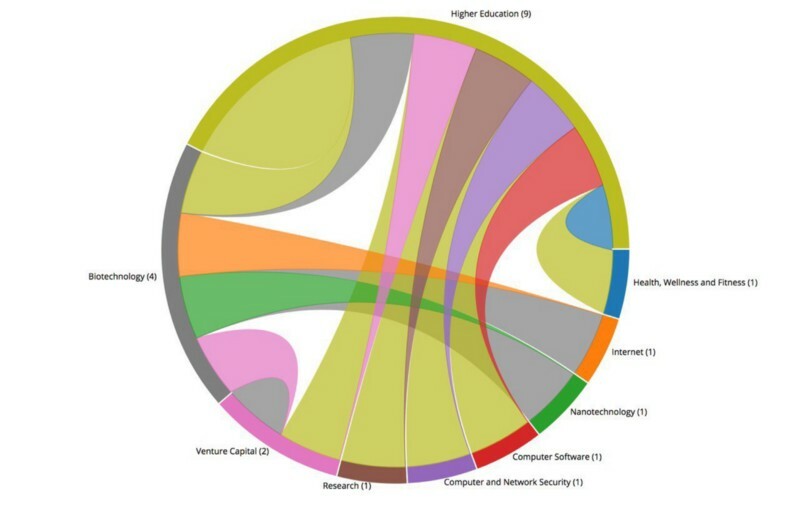 New connections made from a cohort in an engineering commercialisation program we run in the UK. Increasingly, the only relevant experts out there are not strong educators — they often don’t have blogs, presentation slides or even strong articulation. In managed peer learning environments, their job is to have the wisdom and experience to share, but they aren’t expected to be able to teach. The educator’s job to is to identify and connect these experts to the learners, and to create environments where they can share their wisdom and spread their mindset. Inherently, this comes with separation of the educators role from that of the domain expert. Since the experts themselves are not educators, educators needs to work with them. Facilitating connectivity is paramount for peer learning, and in managed peer learning it’s part of the educator’s responsibility. Yet connectivity is more than linking the learner to knowledge. It’s about enabling the learner to leap over the constraints that keep them from the knowledge they need. These constraints are generally caused by either the lack of common language between knowledge disciplines, the lack of authority to position requests for knowledge in other networks, or by the sheer limitation in reach of the learner’s personal network. This is where hyper-connectivity comes in. The “hyper” means being able to make meaningful connections that jump outside of the learners network, to the most relevant sources of wisdom wherever they are in the world. At first, hyper-connectivity means manually brokering connections. The facilitator appraises the learner’s needs for introductions to expertise, and then curates connections to the relevant expertise within the facilitator’s reach. Curation here consists of creating a pitch to seduce the expert’s contribution, showing them where, and how they can help. When learners are able to voice clear requests for learning something from outside domains, these challenges become an attractor to distant experts. The quality of the challenges themselves, and the clarity in which they are voiced, now become compelling intellectual puzzles. The challenges posed by the community become opportunities for experts to open up new career paths, to develop their craft, and sometimes to progress the state of their art. It takes work and hustle to individually invite experts and broker them to specific learning needs. Many education programs struggle with inviting experts as guest speakers or mentors. Getting expert involvement is an onerous act of making sure the expert can prepare, that it’s worth their time, and convincing them to commit to the program schedule. Peer Learning also helps experts learn from each other. Experts see merit of the challenges that the community is working on, and know that other experts will too. The peer learning context attracts different experts that can all teach each other. Once this starts to happen, there is much less need for manually brokering connections, as the relevant hyper-connections that bridge knowledge domains are self-sustaining and automatic. At this stage, the distinction between learner and experts dissolves, as the educational institution now also addresses what the experts want to learn. A pinnacle of hyper-connectivity exists when institutions develop a reputation for hosting learning events that are core to the state-of-the-art in specific communities of practice. 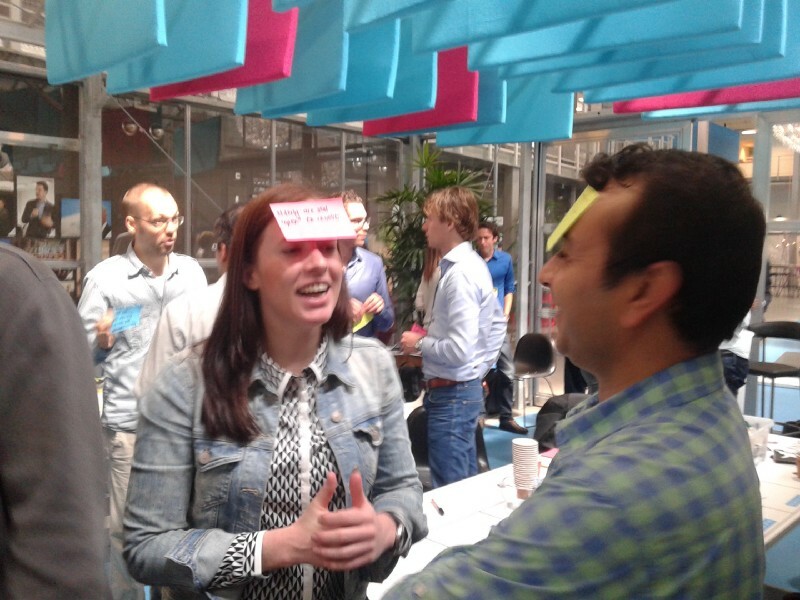 Unconferences like Barcamp are a great example — they attract novices and experts alike, since everyone can learn something relevant, and build useful relationships. Level 0: Unconnected. The only source of knowledge is the person standing at the front of the room. Level 1: Selective. The education program provides relevant introductions, mostly brokered through people involved with directly delivering the program. Level 2: Instant. The educational experience attracts a relevant and diverse group of domain expertise, so as needs emerge they can be addressed with seamless lead time, and under full directive of the learner. The previous paragraphs showed the factors of responsiveness, agency, and hyper-connectivity. All of these are needed for a program to evolve into a full-fledged peer learning experience. Read on to the next chapter on how to evaluate your learning curriculum by applying the Peer Learning factors to your own education programs! This section we shared from the Peer Learning Guide (You can read more by signing up to the newsletter) is an attempt to re-define Peer Learning in a broader context. Previous works have defined it as student-to-student learning in a traditional education institution. We want to include other types of learning. For example, emerging communities of practice that are self-organising like artists figuring out a new style, meetups that regularly connect a loose group with a common interest, farmer field schools where farmers visit each other, or writer feedback groups that help each author improve their work. We’d love your feedback on this. What are the peer learning environments you’ve seen? Do these dimensions and levels apply?